THIS IS A BEAUTIFUL OLD VINTAGE TIARA CROWN IN A NICE LARGE SIZE THAT WOULD BE WONDERFUL ON AN OLD STATUE OR IN A DISPLAY. IT HAS A STUNNING CROSS WITH A SINGLE LARGE PURPLE RHINESTONE AT THE CENTER. This crown is older and is of good quality. This has a very nice pattern and it has a gold metal band. There is some color variation and wear to the band. The band is adjustable. At the center is a 22" tall ornate cross with a gorgeous single prong set rhinestone in light purple at the center. PLEASE NOTE THAT THE BAND IS NOT PERFECTLY ROUND OR EVEN, AS I SHOW. 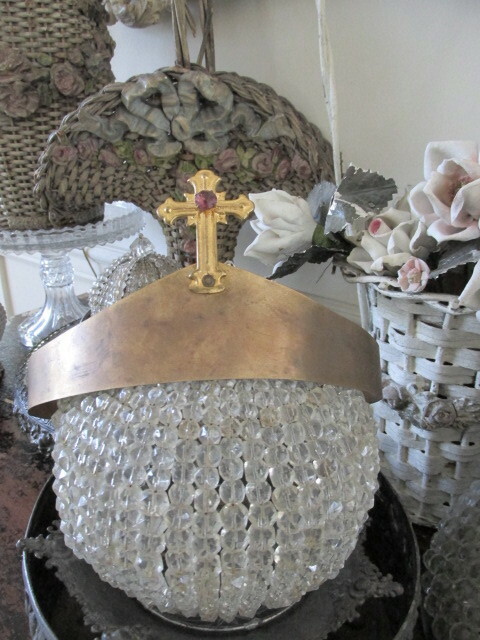 You can dress up an old statue or set it out with your collection of crowns and tiaras, or display on an old dress form. Perfect for your shabby chic, Antique, Victorian, Art Decor, Paris Apartment, French Country, or Cottage decor. Measurements are about 3 1/2" tall by 6 1/2" wide and 6" deep as shown. THIS IS FOR THE CROWN ONLY.